Valladolid (population 337,000) is at the confluence of the Pisuerga and Esgueva rivers, close to the river Duero. Once the capital of the kingdom in the 16th century today it is the capital of the autonomous government of Castile and Leon. As late as 1960 its development had mainly taken place on one side of the river, in a dense urban fabric. After that date the town has stretched out down both sides of the river with a vigorous growth, which, with some ups and downs, is still the case at present. 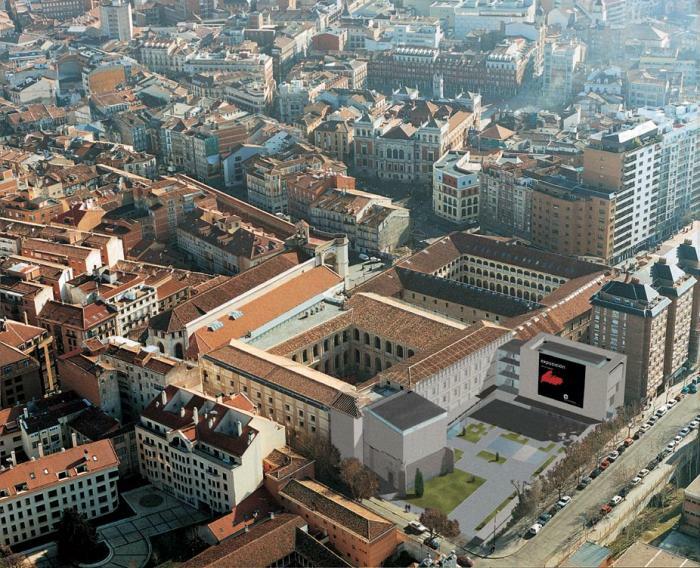 The two projects currently under construction, the Museum of Spanish Contemporary Art and Valladolid Science Museum, are part of an ambitious policy to revitalize culture undertaken by the local council. The former, designed by architects Juan C. Arnuncio, Javier Blanco and Clara Aizpún, is located in the heart of the old town restoring a part of the most important Benedictine monastery in the 16th century Castile. 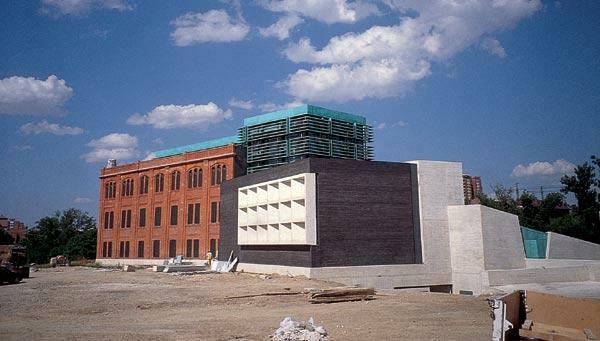 The other museum, planned by architects Rafael Moneo, Enrique de Teresa and Juan J. Echevarría, is restoring the main body of the old flour factory of El Palero situated on the other side of the Pisuerga River, far from the old town. The two projects represent a qualitative leap in a process started two decades ago in the interests of a general improvement in the urban conditions both in the centre and the surrounding areas with an important lack of urbanization and cultural and social facilities. The 1984 General Plan of Urban Regulation, the main driving force behind that process, at that time meant a radical switch in the town planning made so far, proposing a policy of a systematic revitalization and redesign of public spaces, at the same time curbing the indiscriminate demolition of old buildings promoted in previous decades. The first pedestrianizations were undertaken, new public buildings were created in the suburbs, and the restoration of historic buildings was encouraged. As a result of this policy there was an obvious improvement in the environmental conditions of significant parts of the town, and above all, a change in the population's perception of their urban heritage. This policy was approved with the revision of the General Plan in 1996, which broadly maintained the same policies, but with more determined interventions to boost an urban process which must continue to be efficient and equitable at the same time, but also be capable of responding to the always complex cultural and social reality of the population. More attention is given to the morphological and structural aspects of urban development with attempts to systematize and regulate the policy on the revitalization of public spaces and facilities of the previous plan. One of the aspects now reinforced is the one regarding the creation of new centres in different areas of the town. The projects mentioned here must be understood in this context. Their innovation is, on the one hand, their greater cultural ambition, and on the other their direct relationship with a more general strategy of the town's economic dynamism. Valladolid has aimed to make the most of its strategic position as the capital of the region and to promote its tourist appeal with the renewal and new construction of these cultural facilities, which have a common interest to preserve and restore a valuable heritage, along with a determined commitment to revitalize and make the respective sites more attractive. The Museum of Spanish Contemporary Art has arisen as a result of the agreement signed in January 2000 by the municipal council and the Contemporary Art Collection Association, owner of one of the most important collections of Spanish contemporary plastic art works. It was created in 1987 with the contribution of about thirty private companies, and contains a collection of around eight hundred works of Spanish artists from between 1818 and 1996. It was decided to house the collection in the historic monuments comprising the Patio Herreriano (the main courtyard in the monastery of Saint Benedict, a formidable Renaissance cloister, work of Juan de Rivero Rada) and the remains of the Gothic chapel of the Counts of Fuensaldaña. The monastery of Saint Benedict was founded in the late 14th century, in the old fortress of the city. Its increasing prestige reached its peak during the Renaissance. With the confiscation of the assets of the religious orders in 1835 the congregation was expelled from the convent, and the building was used as a barracks up until 1900, when it passed into the hands of the Local Council. The architectural intervention planned to turn it into a museum and restore the Renaissance structure, trying to provide it with the necessary elements to carry out its new assignment appropriately. The project favours a clear interpretation of the historic architecture around the exhibition spaces. The new coverings are in harmony with the patina of the faces of the original walls. The complex is completed by a new complementary building that extends the available area for exhibition rooms, storing areas and workshops, administration, research etc. The collection is distributed through eight rooms, saving some of the most beautiful spaces of the old building for the temporary exhibitions. The restoration will be useful not only for the recovery of this important architectural heritage situated right in the historic and administrative centre (it is part of a complex which contains municipal buildings, historic archives etc.) but also, with the proposed use, for the promotion of an efficient focus of urban centrality in this part of the town. The intervention is completed by aiming to restore the surrounding open spaces, which from 1950 have undergone drastic changes with the construction of a secondary school and the opening of new streets. There is a proposal for more intensive harmony between the historic layout and the subsequent policies, as a framework for the new museum. 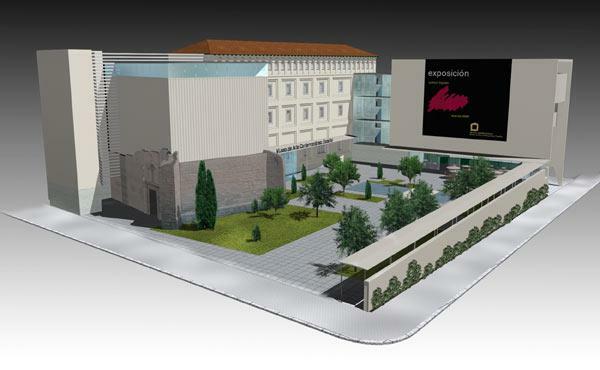 With the Science Museum, Valladolid intends to fit into the modern trend of museums that show scientific and technical progress and a better knowledge of our physical environment, starting from the experience itself, with a mainly teaching orientation. It was decided to choose for its location the grounds of an old flour factory (a dominant economic activity in the town during the 19th century). The remains of the factory have been included in the new building. 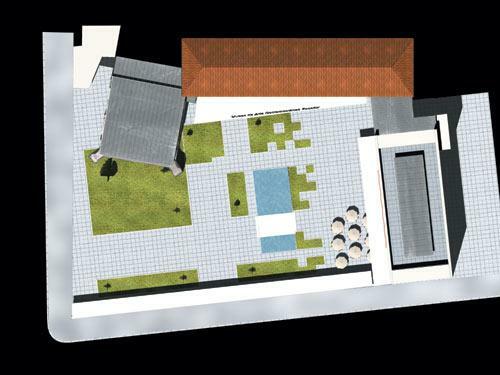 This location suggested taking water as the main thread of the permanent exhibition in the museum, which in turn intends to become a sort of observatory of the current state of science, with detailed information on the new advances. The project restores the main body of the factory, as well as the hydraulic works, which made the river banks adequate to guarantee the good working order of the mill, giving rise to the two islands that are characteristics of the area nowadays. The image of the building alludes to its original industrial condition, a complex made up of different autonomous parts, juxtaposed to form spaces of different urban significance. 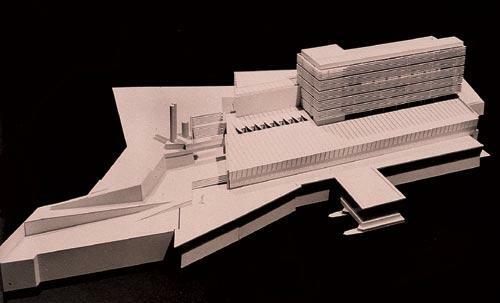 The constructions are set in such a way as to form an access square and museum hall, and they include a system of pedestrian precinct with ramps and footbridges, which cross over the bridge and the nearby road. The permanent exhibition takes up the three floors of the old factory together with an adjoining pavilion (the so-called 'Pavilion of the Meridian'). The temporary exhibitions and the complementary activities of the museum (planetarium and video conference room, children's museum, astronomy observatory, library etc.) are set around the square. In addition to the planned footbridge, the museum looks onto the river with its most transparent façade, aiming, with a treatment of oxidized copper, to achieve harmony with the vegetation and the water that is reflected in the curtain wall. 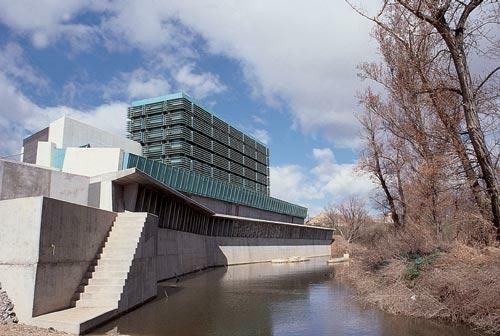 If the Museum of Contemporary Art contributes to the revitalization of the historic centre, the Science Museum directly benefits the Pisuerga River. This intervention also includes ambitious urban developments and landscape restoration all around the area, the islands and both banks of the river between the two bridges which delimit it. It is still early to draw any conclusions. The construction of these buildings has not yet been completed, and it is difficult to predict their effects, even in the short term. However, the commitment to a cultural activity that goes beyond the purely local sphere has already become an important stimulus in all the urban developments, both to restore and to create new urban spaces. A medium-sized town such as Valladolid does not have the tension of the large metropolitan areas and needs to secure those stimuli. Only in this way can it take on projects that will allow light into the hidden qualities of its diverse places.